Conspicuous for its consumer ethic, the computer industry has always embraced the belief that “more is best” — more machines, more processors, more power. 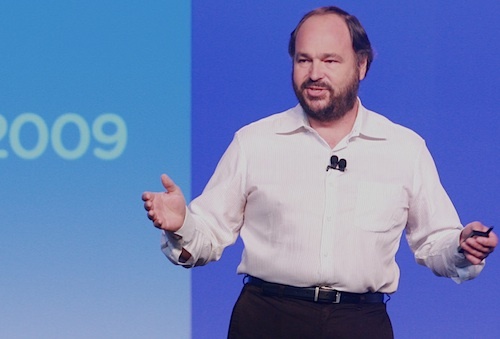 Turning that on its head is Paul Maritz. Zimbabwean-born and SA-educated, Maritz is spearheading a move to decrease the number of computers an organisation uses by making existing resources more efficient. At the same time he has companies like Microsoft firmly in his sights. Maritz is a heavy-hitter in the IT world and the CEO of VMware, a company that produces “virtualisation” software. Like Google’s ubiquitous search engine and online desktop applications, VMware’s software is a significant threat to Microsoft, which appears to be caught almost in a pincer movement between the two companies. Computers essentially work in a hierarchical chain made up of three principal components — hardware, operating system (OS) software and software applications. Hardware is the physical machinery that makes up a server, desktop or mobile computer and is basically dead metal and plastic without an operating system. The OS is the software that brings the hardware to life and allows it to process instructions from the useful stuff, the applications. These are the programs that include everyday desktop tools like word processors, spreadsheets, e-mail, Web browsers and schedulers. Historically Microsoft has retained the money-spinning lion’s share of the operating system software market through Windows and desktop applications in the form of its Office suite. It’s a tidy business that has propelled the company to dominance in the past three decades. It’s been a long time coming, but the company now looks like it is facing its most significant competition since its early days — and on two fronts. Google is threatening its desktop business by capturing a growing share of Web space and making inroads into the applications market by offering its own office software, Google Docs, for free online. VMware, meanwhile, is accelerating its movement into the OS space with its virtualisation software — programs that may eventually supplant OSes altogether. Classed somewhere between OS and desktop software, virtualisation software is predicted by analysts to become the de facto operating system on most business computer infrastructure in time. Already, 970 of the world’s 1 000 largest companies use virtualisation technology. Maritz is in a unique position to fire the broadside on OSes — until 2000, when he retired from Microsoft, he was third in command at the company, behind cofounder Bill Gates and the now-CEO Steve Ballmer. He worked at the company through its strongest growth years. His responsibilities included overseeing the operational development of the company’s desktop, server and Internet software. Prior to that, he worked at chip-maker, Intel. On the phone, his voice is measured and he has a curious blend of SA and American accents. Educated in SA, Maritz is a Hilton College old boy. He graduated from the University of Natal and the University of Cape Town with degrees in computer science. In SA to drum up business and visit family, Maritz says a fundamental change in the way we use computers is on the cards. And it begins with doing more with what we already have. In the run-up to the Y2K date change, companies spent too much on upgrading their networks and systems. Many used the opportunity to standardise on operating systems and applications, but as the Internet took hold and organisations became more electronically interconnected, it became a headache to get disparate systems to “talk” to one another. Software like VMware is operating system-independent and frees up underutilised hardware. “Once companies have undergone the virtualisation process, they’re in a position to do more ambitious things with their computer hardware and software,” says Maritz. Once operational improvements are achieved, virtualisation software can be used to take over functions traditionally associated with operating systems. The implications of this have not been lost on Microsoft, which has instituted virtualisation initiatives of its own as it simultaneously works to stave off threats to its business from Google. I don’t see how VMWare is a threat to Microsoft. You still need an operating system to run your applications on. All VMWare dose is provide you with is virtual hardware. Unless VMWare is planning to create an operating system that is somehow going to complete with the likes of Windows, Linux, Os X etc, what is the threat to MS? It is the hardware vendors that have the most to lose. Sounds like he his following his co worker from Microsoft Will Poole in Joining NComputing Virtual desktop company as their chairman. I agree with Geoff – MS is the underdog here with their virtualisation tech – if anything, they’re taking the fight to VMWare and being very succesful. The article shows that the author doesn’t know much about virtualisation, which is a pity – would have been nice to ask this chap some relevant questions and get some useful answers. VMWare not too long ago pretty much had a monopoly on the enterprise virtualisation front, but it’s being attacked on all sides now by Microsoft, Sun/Oracle and other big names who all have excellent products and are catching up FAST. VMWare isn’t taking the fight anwhere, I think that it’s under siege and trying hard to stop the bleeding. What you need to realise is VMWare is an OS – VMWare ESX for example runs on the ‘Bare Metal’ with a embedded Linux kernel to load additional code. And is is improving rapidly. VMWare aside, the real talking point is the underlying technology and concept. A possible scenario would be Green portable (Netbook?) machines with a neutral embedded VM. The Applications / OS would run directly on the VM natively, without the need for any large incumbent OS in between. You would be able to instantly load up say your app / Guest OS / Binary (a browser for example) and consume (Cloud, Google?) applications Live! on the (by then ubiquitous) internet. We all need to think a little bit further than the current status quo. The real fight will be happening in the cloud infrastructure & web application spaces — In my opinion Microsoft is well behind the curve on these issues. @Trent – VMWare ESX is the other way round – VMWare is the application that runs on top of a linux kernel; it’s this linux kernel that runs on bare metal like any linux distro does. A VM won’t help you load browsers faster or get onto the cloud. You still need an OS at some point to provide the services that that browser/apps run on. The cloud infrastucture is interesting, but nobody’s actually brought out anything that you can describe as “the future”… MS is most certainly on the bleeding edge of this with their Azure Platform and is investing billions of dollars in gigantic datacenters, and everyone expects them to be a major player in this space when cloud computing is mainstream.